Rocky's husband Bob is a veterinarian who indulges in deep fried food whenever one of his "patients" dies, or when he has to tell pet owners their pets are dying from cancer and other diseases. The morning after Bob consumes a carton of fake fried clams from Johnny's Drive-In, he dies immediately upon suffering a heart attack in his and Rocky's upstairs bathroom (meanwhile, Rocky is placing an order with Lands' End to purchase socks. Only in New England). While Rocky tries everything she can to save her husband, it's no use. Shortly after her husband's death, Rocky packs up everything and leaves Massachusetts for a tiny island off the coast of Maine. On Peak's Island, Rocky puts her career as a psychologist on hold and accepts the position of Animal Control Warden with the local veterinarian so she can feel closer to her late husband. Shortly after she settles in to her new home, Rocky befriends a black labrador named Lloyd, who arrives at the clinic after having been shot with a custom-made arrow. Seduced by the way Lloyd has lifted her spirits, Rocky feels inclined to learn more about the dog's history, and even takes it upon herself to learn archery. Rocky soon learns that Lloyd belonged to a woman who is no longer alive, and does everything in her power to make things right with those involved in the circumstances leading up to the woman's death, including her new four-legged pal. Lost & Found started out with a bang! In the first chapter after Bob dies, Rocky (who is still clearly in mourning and not exactly in her right mind) takes Bob's cremains to Johnny's Drive-In. Posing as a health inspector, Rocky pours Bob's remains into the fat fryers that once cooked his beloved fatty food. The teenagers working the counter are oblivious to Rocky's deceit, and do not see her dumping the ashes into the fryers. Rocky then walks out, leaving her husband's ashes behind for consumption by the rest of the population at risk for heart disease. 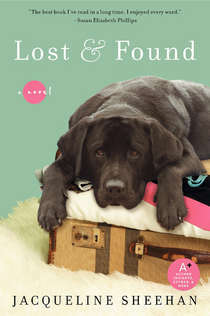 I really thought the novel would be a wild ride after that incident, but the rest of Lost & Found was nothing like its beginning. I'll admit that this novel was entertaining, and a relatively quick read, but I didn't find it too memorable. Readers who have knowledge of archery as a sport or recreational hobby may enjoy the sections dedicated to that topic, but I found the content quite dry. What I DID like about the book was how Sheehan demonstrated how Lloyd (and good pets in general) have the ability to bring happiness and joy to people in their lowest moments. I loved how Lloyd helped the anorexic teenage character learn to eat again, and I loved the short chapters told from Lloyd's point of view. I'm glad everything worked out for the characters in the end. In addition to writing Lost & Found, Jacqueline Sheehan has also written Now & Then, A Comet's Tale, Picture This, and The Center of the World, the latter of which is due to release in December 2015.